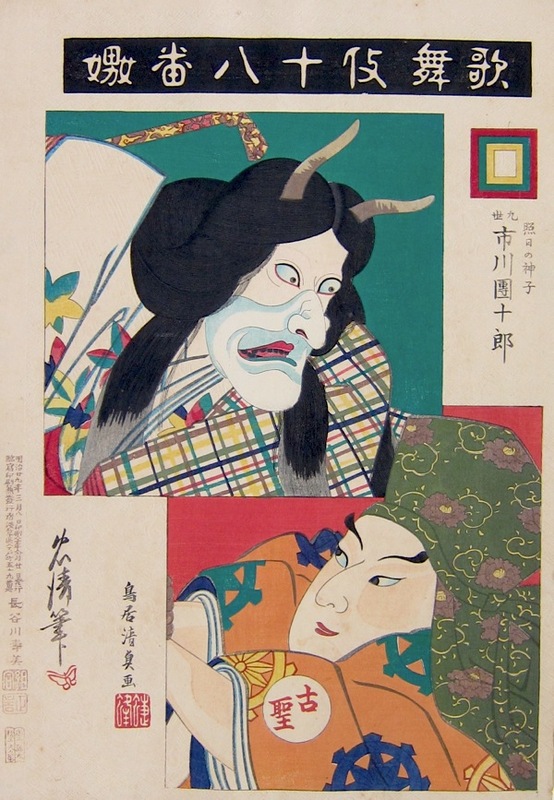 Jusoso Tadakiyo (1875-1941) & Torii Kiyosada (1844 -1901) Ichikawa Danjuro IX as The Demon Uwanari in the Play Uwanari, 1896. Oban. This is a ravishing example of the late flowering of Meiji design - the last real example of the ukiyo-e style before it lapsed into pastiche and was swamped by the newly fashionable frenzy for all things western and modern. One gets so much the sense of a country throwing off (or away) its past in the rush to be accepted into the burgeoning international culture, that prints such as this remain startling reminders of the richness of native Japanese art. Produced in 1896 to celebrate the last great hero of the Danjuro line - a dynasty of actors going back in a line unbroken since 1675, this print was designed and printed the year after Japan had triumphed over China in a very modern and very decisive military victory. But this print, unlike nearly every other produced that year, looks back to a culture of drama, superstition, folktale and values that would soon be all but forgotten. The subject is that of the ghost story of Uwanari, from the play, The Ambush of the Second Wife, and shows Uwanari, the jealous ghost of a philandering husband’s first wife. She returns to haunt him through the body of her daughter. Danjuro wears the hannya mask, traditionally worn by vengeful female spirits in no and kabuki theatre. This series of prints was a co-production by Jusoso Tadakiyo and his father Torii Kiyosada; the latter being responsible for the lower portrait which is drawn in his own distinctive style. The series, commemorating the Kabuki Juhachiban is widely acknowledged to represent Meiji printmaking at its very best. Not only do the designs, which are all exceptional and dramatic, stand out, but the technical achievement has perhaps never been bettered. A superb print in fine condition, the surface is deeply embossed and the colour and impression are all fine. The print is full size and crucially contains all of the marginalia.